Samuel is 64 years old and was diagnosed with ALS soon after his retirement. He and his wife called Disability Network Southwest Michigan for guidance and information about how to start addressing the access issues Samuel would be facing as his ALS progressed. They wanted someone to evaluate their home and provide suggestions and resources related to ramps, bathroom access and other home-access issues. A staff member met with them and provided options, referrals and assistance in addressing mobility barriers. 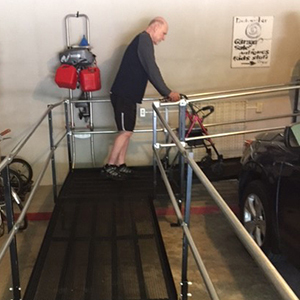 Our Ramp Up re-use program with AmRamp was the perfect answer. The ramp fit in their garage which provided a covered, protected entrance to the home. Samuel immediately felt safer being able to exit his home independently and safely. They love the slick look of the steel ramp and greatly appreciated the help from Disability Network.